Walking through the galleries of this exhibition can feel at times a little like leafing through pages of a high-school yearbook; some of the pieces are impenetrably entrenched in their social contexts. Many are records of ephemera related to a time period when participation and the kinetic nature of idea exchange were as central to the art-making process, or more so, than the production of artworks. It is worth having the patience to decode the visual banter and fill in the historical gaps between works, as the time period in question represents a revolution in both the presentation and the creation of work that foregrounded contextualising decisions by individual artists (as well as spectators), and engendered an artistic legacy that has trickled down into everything from contemporary performance to YouTube. The exhibition focuses on Amsterdam as a hub for conceptual thought and production in the 1960s and 70s: travel is a critical subtext for the exhibition, which includes the work of Bas Jan Ader, Stanley Brouwn, Hanne Darboven, Jan Dibbets, Ger van Elk, Gilbert & George, Sol LeWitt, Charlotte Posenenske, Allen Ruppersberg and Lawrence Weiner. Between approximately 1955 and 1975 the number of commercial airline passengers more than quadrupled. There is, across the exhibition, a sense both of existential unease and responsive humour regarding the cultural transience that was permeating the world at this crucial step in globalisation (this was also prime time for burgeoning numbers of television sets in the world). 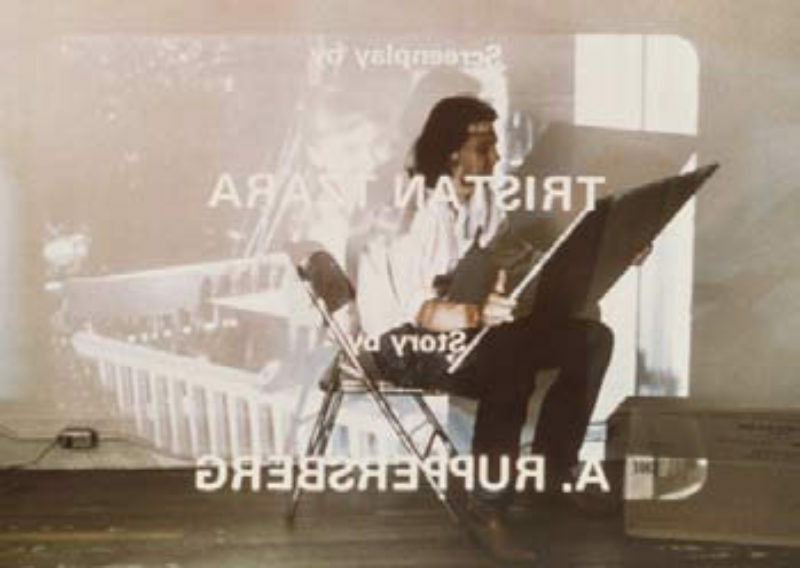 A number of these artists hopped between the Netherlands and the United States, Los Angeles in particular, finding an intellectual home in the conceptual movement that circled around the Chouinard Institute at CalArts and included artists like Allan Kaprow and John Baldessari. It’s significant that the gallery system at the time was also changing structurally. The new popularity of international travel accelerated the circulation of exhibitions between institutions and prompted artists to consider issues like portability of work. Another bubble to the Venn diagram of time and place, whose overlap constitutes the arena for this show, is the fact that many of the artists were showing in or in conversation with the Amsterdam gallery Art & Project. Bulletins issued by the space, a number of which are on view, were printed and mailed internationally and served both as exhibition announcement and aesthetic advocates for the decentralisation of artwork through the inclusion of pieces made especially for its pages. Not surprisingly, many of the works in the MoMA show deal in the language of place and significance, or lack thereof, of location through an investigation of the body in space. Bas Jan Ader, whose work constitutes some of the most entertaining and emotive in the show, is the rambling man; one feels one is snatching glimpses of an existential questioning of roots in his work, and the pull is visceral. Ader could be a bit of jokester; the short films ‘Fall 1’ and ‘Fall 2’, both 1970, which feature him, respectively tumbling from the roof of a house and careening on his bicycle into a Rotterdam canal, elicited guffaws from nearly every passer-by in the show, the serious side of instabilities buried in its link to slapstick humour. There is distinctive pathos, however, in the photographs of ‘In Search of the Miraculous (One Night in Los Angeles)’, 1973, a black-and-white series that features the artist wandering the highways of Los Angeles after dark, photographed from behind by his wife Mary Sue Ader. Ader made a life of travelling, after adopting California as his second home. ‘In Search of the Miraculous’ was to be presented in the Netherlands after being shown in LA, the two destinations linked physically by a sail Ader was to have made between the two cities in his 12-1/2 foot sailboat. He disappeared at sea. Sol LeWitt’s work gains social dimension by its inclusion in the context in which it was conceived; it was in the Netherlands that Lewitt first came up with his by-instruction pieces and he executed one of his first geometric drawings in the Art & Project bulletin. A handsome set of Amsterdam street maps, cut to remove polygonal areas delineated by his own point-to-point travels. Allen Ruppersberg’s ‘Overnight’, 1970, a grid of 45 envelopes self-addressed to Hilton Hotels from Rome to Cape Canaveral, is on the dry end of the spectrum. Gilbert & George took the approach of creating their own aesthetic island through their practice of living sculpture. The concerns of displacement had the frequent effect of re-empowering the individual artist by shaping his or her own context; Charlotte Posenenske took this to literal lengths with steel sculptural forms that could be repositioned by collectors like an unprecious, oversize game of Tetris. While there are formal gaps between the included artists, the curatorial premise of a cross-section of time and place is an energising one, absolving the viewer of the responsibility of connecting the works and freeing us to see the relevance of the variety of represented conceptual approaches to our own very contemporary up-endings of time, space, and context.